Pictures and photos of Saint Denis Cathedral, Paris France. Apart from being the Royal Necropolis for 800 years, with only 3 of the monarchs not being buried in Saint Denis between 1000 and 1789, the Basilica is also the prototype of all the great Gothic churches that sprung up throughout northern Europe. The body of Saint Denis was buried in the Greco Roman cemetery, along with the bodies of Saint Eleutherius and Rusticus, on which the Basilica of Saint Denis is now built. The burial ground became an important pilgrimage site and in 475 St Genevieve purchased the land and built a Church there which developed into a monastery. 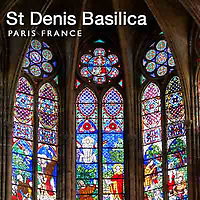 In the 7th century King Dagobert I built a Basilica with a shrine to house Saint Denis relics and in the 12th century Abbot Suger started building the present Gothic Basilica. In 751 the Merovingian Pepin the Short was anointed as king in the Monastery and from the death of Hugues Capet in the 10th century the Basilica became the resting palace of the French Kings and Royal families. On entering the building visitors are confronted with the full theatre of the later high Gothic style. The second part of the older Carolingian church to be replaced by Abbot Suger was the Choir in 1140-44. Here the full potential of the Gothic is realized with high columns that soar upwards to a stone vaulted ceiling. Between the pillars are stained glass windows with scenes from the martyrdom of Saint Denis. The Naive was the last part of the church to be developed by Abbott Odo in 1231. By this time the Basilica was recognized as the French Necropolis and utilises the full potential of the Gothic in a flamboyant or Rayonnant style that uses intricate stone tracery to enhance the decorations around the windows and columns. The great Rose window of the North Transept depicts “Creation”. Its intricate design is a wonder of medieval Gothic architecture showing the extraordinary height the skills of the medieval masons had reached. The naive, choir, side aisles and crypt are filled with the tombs of the French Royal houses from Pepin the Short to Louis XVI and Mary Antoinette. Medieval Europe may have been a dangerous ruthless place to live but it was not, as is commonly believed, without high art. Saint Denis, along with the other great medieval monumental buildings, is proof of the incredible skills and sense of adventure that man possessed especially when it came to venerating the glory of God. On entering The Basilica of Saint Denis the average medieval man, coming from his wooden thatched house, must have thought he was entering Heaven, it still fells like that 1000 years later.